Ducati seemed to have impeccable timing when it introduced the sub-brand “Scrambler” for the 2015 model year with the original Icon. The retro style, 803cc air-cooled twin and modern performance aimed at the heart of an emerging market. 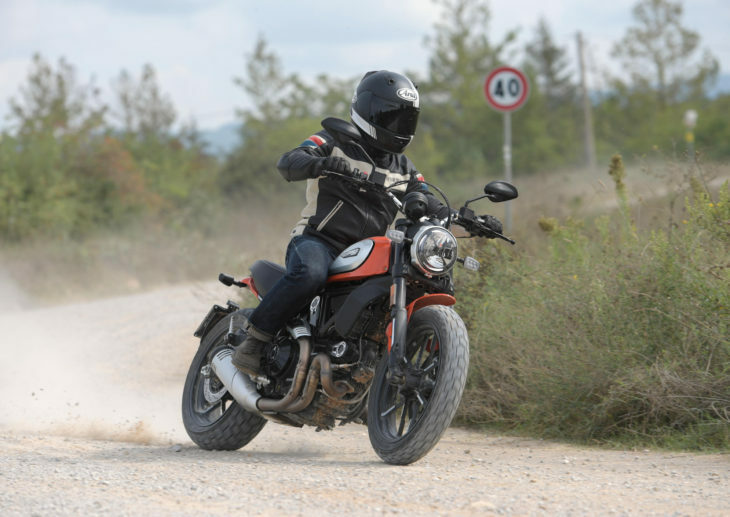 Ducati has now sold more than 55,000 Scrambler units, forming a very large portion of its business. The Scrambler sub-brand continues to flourish as Ducati introduces additional models, including the Scrambler 1100 we recently tested. 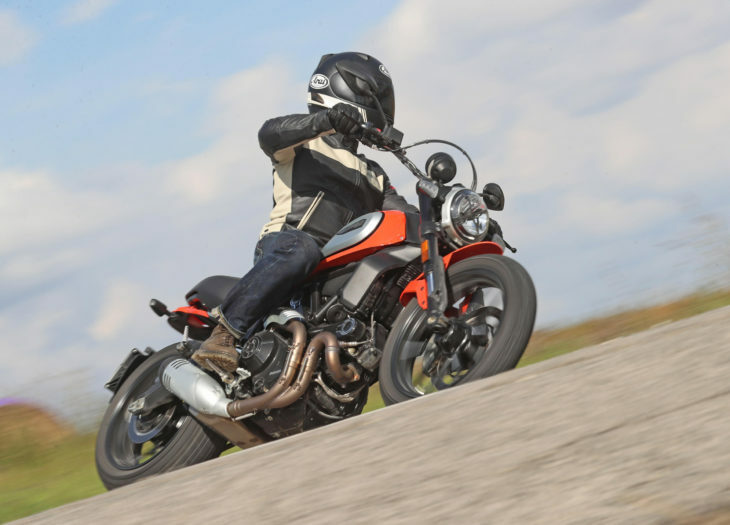 In short, Ducati’s Scrambler formula is working, and the recent refresh of the Icon model correctly includes subtle refinements, rather than drastic changes. Those refinements include cosmetic tweaks, such as the revised aluminum side-panels on the gas tank, a new headlight that includes a black “X” mimicking the tape used by off-road riders to protect the lens, a black-painted engine with brushed cylinder fins and a machined surface on the spokes of the black rims. 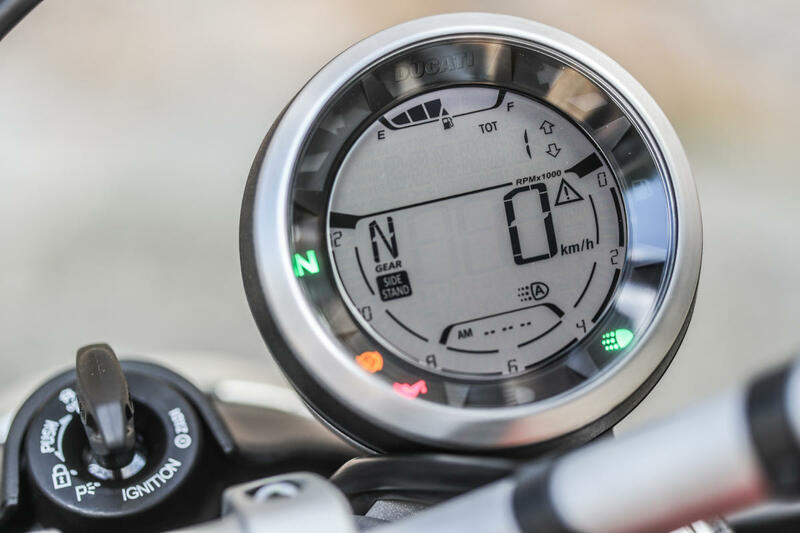 Self-cancelling turn signals accompany “more ergonomic switchgears” on the handlebars, and fuel level info as an added feature on the instrumentation. The clutch is now hydraulic, rather than cable operated. A new flatter seat and revised suspension settings are aimed at improving comfort and handling, but the big news is the addition of Bosch Cornering ABS, which takes information from an IMU to tailor ABS to traction conditions. The Scrambler Icon is powered by the same 803cc V-twin as the previous model with 73hp and 49lb-ft, which provides solid mid-range power and is quite fun to ride. We found power delivery to be very smooth and controllable, and throttle response is smooth. The suspension initially felt very soft, especially in the rear, but after a bit of riding we felt it was set up well for our test rider’s 155lb body. In keeping with the relaxed but fun nature of this bike, it is not a super sporty setup. What the suspension lacks in stiffness, it makes up for in comfort and stability. The bike always felt firmly planted through bumpy pavement, whether the bike was leaned over or straight up and down. Off road, rocks and ruts were not an issue. Overall, the bike felt hard to upset no matter what the terrain was. The seating position of the Scrambler is very relaxed and upright, with foot pegs back far enough that the bike doesn’t feel like a cruiser, but gives plenty of leg room to not feel cramped. The redesigned seat was very comfortable through roughly 5 hours on the bike. The relatively flat profile gave us some options for seating position if we wanted to be a bit more over the bars for quick riding, or back on the fat part of the seat when we were cruising. 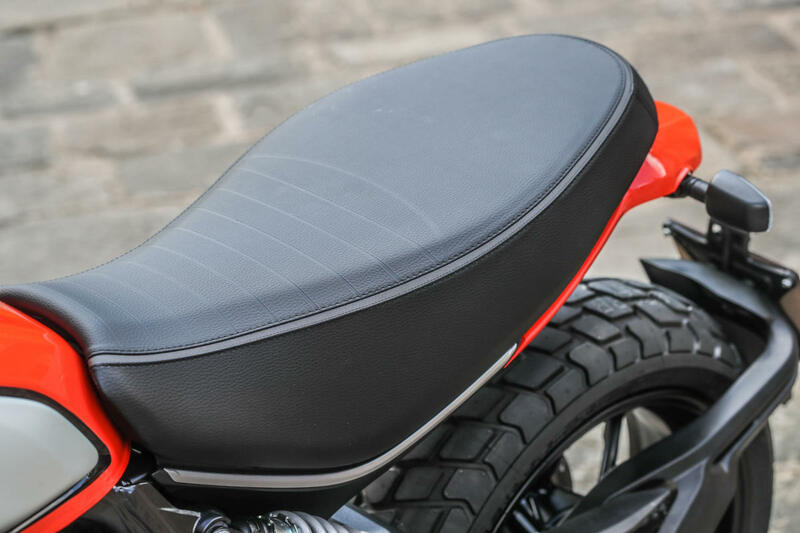 At 5’6”, the new lower seat height was a welcome change for our test rider, though the previous model already had a very low seat — flat footing at a stop was very easy. The bike also felt quite narrow. Our one complaint about the ergonomics is that the bars felt too high. We imagine they would be a good height for a tall rider, but our test rider’s hands were too high for their shoulders to fully relax while riding. The brakes on the Scrambler Icon are improved this year with Bosch Cornering ABS, which is very nice for new and experienced riders alike. This system allows the rider to get away with overly aggressive braking mid-corner with no worry of losing the front end. We never felt the system was intrusive or surprising. Besides the new electronics, however, the brakes are one of the weaker points of this bike. The single disc front brake had adequate, but not impressive power, and lacked the feedback of more sophisticated brakes. For relaxed riding these brakes were fine, but they left us wanting more when pressing the bike hard through corners. Cornering ability of the Scrambler did not disappoint. Despite somewhat cushy suspension, the bike changes direction easily, probably due to the low weight and center of gravity. The semi-knobby tires stuck through paved corners well and proved to be confidence inspiring at peg-scraping lean angles. The off road riding we did on this trip was mostly on flat, hard packed dirt that the Scrambler handled with ease. Cornering on this surface felt easy, considering the 417lb claimed wet weight of the Scrambler, and the bike was light and nimble enough to have some fun sliding the back end, for example. For more serious off road riding, we suspect bottoming the suspension might become an issue on this model. The LCD instrument display remains nearly the same as the previous Icon, with the addition of fuel level info. The menu was easy to scroll through using intuitive hand controls. We didn’t get a chance to test the new Ducati Multimedia System, which allows for bluetooth connectivity to answer calls, control music, and talk with a passenger The LED Daytime Running Lights provide good visibility for the bike during the day without being blinding to oncoming traffic. We did not get a chance to test the headlight in the dark. The six-speed transmission of the Scrambler shifts easily and smoothly, however we were slightly irked by how tall second gear was. In particularly tight corners, second gear frequently felt too tall to provide significant drive on the exit, while first gear was too short to be effective. This was only a problem on very tight corners, of which there happen to be quite a few in Tuscany. The Scrambler’s clutch has been updated to provide a softer pull, which was in fact quite easy to use. The adjustable clutch lever is also new and was helpful for our test rider. 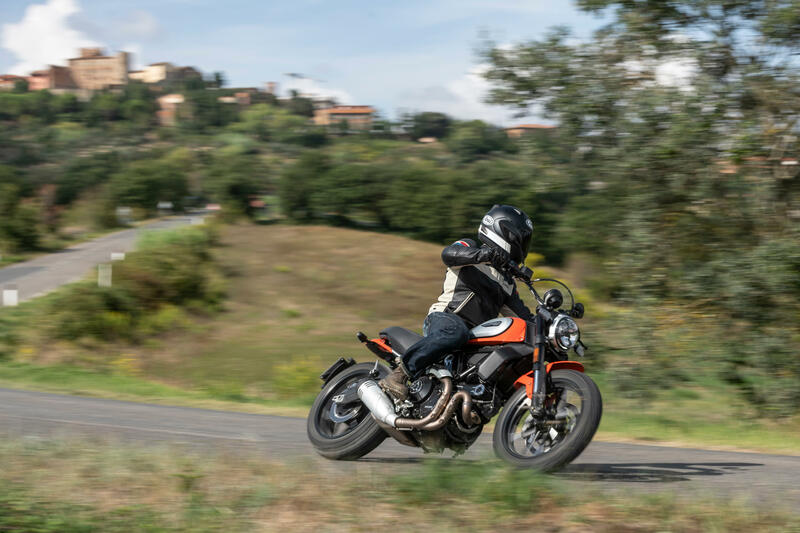 Over the course of three days in Italy, the Scrambler philosophy was mentioned to us over and over — motorcycle riding is about having fun, plain and simple. The bike you are on, how fast you are going, or what you look like while riding, are all secondary to the joy of leaning through a turn or simply rolling through beautiful countryside. The Scrambler Icon is a perfect embodiment of this philosophy. Despite some shortcomings in performance, it was an incredibly enjoyable bike to ride. This was in part due to the fact that it is also an incredibly easy bike to ride — one of the most beginner friendly bikes we have ridden. That ease of use leaves the rider more free to simply enjoy the journey. 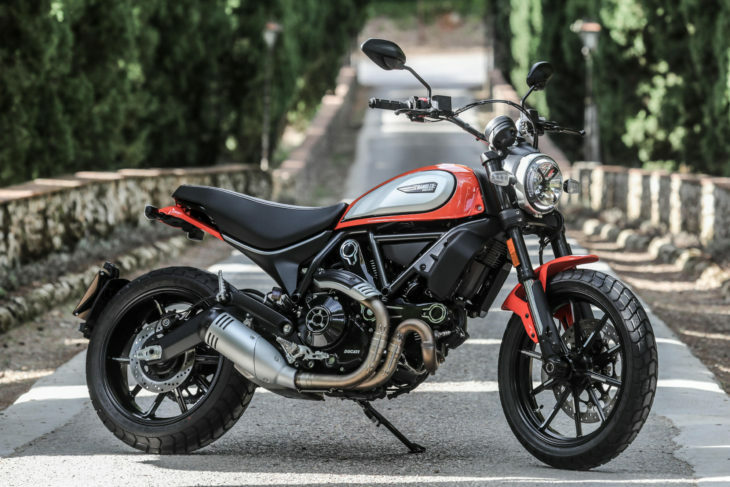 The 2019 Ducati Scrambler Icon should be in dealers during the first quarter of next year. Color options include Yellow, priced at $9,395, and Atomic Tangerine, priced at $9,595. Take a look at the Scrambler web site for additional details and specifications. Suzuki GSX-R1000 Ryuyo: 209 Horsepower and 370 Pounds! It looks like a really fun bike, and I could see renting one if I flew into Europe or any other good riding location. It’s a bit too cold most of the year here, and this is a bit too unpractical for an everyday bike, but I lived in So. Cal. I might consider it. 417 lbs/73 hp/handles > how much again? “a new headlight that includes a black “X” mimicking the tape used by off-road riders to protect the lens” What?? Where do you get these idiotic ideas? The tape was used on old race cars and bikes to keep the broken glass from littering the track and puncturing tires. It wasn’t to keep the headlamp from breaking, it won’t. If you don’t believe me get a GLASS headlight (that’s what they were made of back in the day) put a couple pieces of tape on it and throw rocks at it. When you hit it a good one it will break. I’m not the target audience for this but it seems like a decent enough “premium” alternative to the CBR500 or SV650. I feel like a lot of these are going to spend their lives on trickle chargers under covers in the back of suburban garages. A minimalist, air cooled, 2 va;ve Ducati, that passes emissions. They didn’t mention traction control. I might have to have another Ducati! Bein an off road guy, I am surprised that the spring on the exhaust pipe still hasn’t been moved to a safer location. Lop off one of those cylinders, ala SuperMono. Another inch or so of suspension at both ends. Eliminate unnecessary plastic shields, etc. THAT will be my Scrambler! Maybe Ducati could just buy that weird, backward single design from Rotax, like BMW does, and call it the Nuevo Super Mono. And make it look as much like the original 450R/T while adding that extra travel – that would be my Scrambler. I own a 900 Monster and recently rode a Scrambler 800 for the first time. It was very impressive, and for about the same price in 2018 dollars, as my 900 was in 1999 dollars, it seems like a good value to me. And being 20 years older than when I bought my Monster, the riding position and cushy seat sure felt nice. I’m pretty fond of Ducati’s Scramblers -just nice, minimalist bikes. They look modern to me despite the obvious nod to the past, which is a good thing. There isn’t really anything spectacular about the components or performance, but that actually seems to be part of the bike’s charm. The only downside to the package I guess would be that $10K might be a little steep for what should otherwise be an $8K bike. But, hey… If the recipe is just right, I don’t mind paying a little extra for the secret sauce. The new UJM is from Italy. Whodda thunk? I like the look of them too. A simple bike for the simple pleasure of riding. However, it’s “just” fine for that 5’6″ and 155# test rider. Luckily it’s cheap enough to make it affordable to upgrade the shock and fork for us larger, heavier American types. Give the 1100 a look. I think that one is pretty nice. I can’t see anything wrong with this bike. Nearly 6 inches travel front and rear with 31.9 inch seat height. I could be very comfortable on a bike like this. Nearly 60 inch wheelbase. Useful on dirt roads and highways. Ok it’s not a sports bike but it’s also not an adventure bike with all of its useless to me plastic clading. Should this be the new standard? OK its to much engine for me. Couldn’t Honda do this with the African twin or their 750 Adventure bike or Kawasaki with its 650 twin? Suzuki sells the same engine in enough V-Stroms and SV650s, I don’t know if they’d see any need to put it in another bike to split the difference. The Scrambler line is more about creating a marketing success rather than an outstanding motorcycle, but Ducati ended up doing a bit of both. They also were able to promote the Scrambler without killing off the Monster, an earlier marketing coup. Not that there is anything wrong with selling a bunch of motorcycles, as that is what allows Ducati to move ahead on many fronts. Basically Ducati has been able to create two parallel yet distinct lines of standard motorcycles, with enough differences and pizzaz to have each stand on its own merits. Those who like traditional bikes with a bit of flair should be pleased with what Ducati is doing with the Scrambler brand. The fact that they can produce a desireable Euro bike under $10k is a bonus. Cept it’s as much a Thailand bike as a Euro bike. Yeah, aren’t they all. I’ve had a couple of Thai built bikes and the quality was more than acceptable.